package product is designed to support the building of digital video surveillance recording system in your personal computer. When integrated with the networking over Local Area Network (LAN) or Dial Up, Lease Phone Lines, Wide Area Network (WAN), it provides the support to the optional Remote Intelligent Playback Function. You can connect 4 cameras in the same time to see or to record on your computer Hard disk. you no longer need a VCR to record and change the tape every hour. This is specially suitable for shops, ware house, homes for nany cam etc. SK2000f package product is designed to support the building of digital video surveillance recording system in your personal computer. When integrated with the networking over Local Area Network (LAN) or Dial Up, Lease Phone Lines, Wide Area Network (WAN), it provides the support to the optional Remote Intelligent Playback Function. ¡ì The completed system provides platform for system integration with other security control systems, such as access control, fire alarm or automation, ID/smart card system, intrusion detection, etc. ¡ì The product is designed to run on a Pentium II or above PC with a Windows operating system. 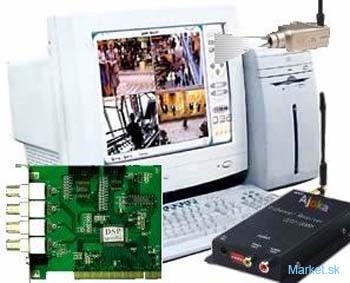 ¡ì The product (Base and remote client package) will consist of video capture board(s) with compression, plus the application software and user manual.